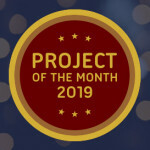 Nominate a project that you are working on and passionate about for the “Project Of The Month” award. I am starting a new series of posts called “Project Of The Month”. Each month I will showcase the most compelling project suggested by you.